It’s hard to imagine a Christmas season without the story of old Scrooge, Bah Humbug! 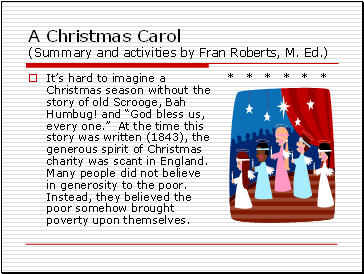 and “God bless us, every one.” At the time this story was written (1843), the generous spirit of Christmas charity was scant in England. Many people did not believe in generosity to the poor. Instead, they believed the poor somehow brought poverty upon themselves. In a clever play on words, Dickens divides the book into 5 “staves” instead of chapters. 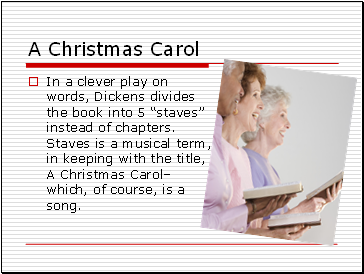 Staves is a musical term, in keeping with the title, A Christmas Carol– which, of course, is a song. 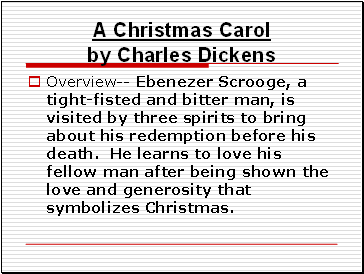 Overview-- Ebenezer Scrooge, a tight-fisted and bitter man, is visited by three spirits to bring about his redemption before his death. He learns to love his fellow man after being shown the love and generosity that symbolizes Christmas. 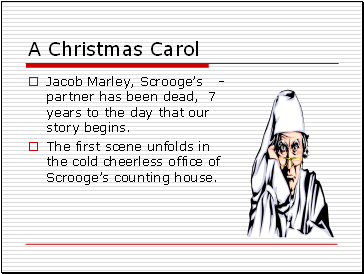 Jacob Marley, Scrooge’s partner has been dead, 7 years to the day that our story begins. The first scene unfolds in the cold cheerless office of Scrooge’s counting house. As his faithful clerk Bob Cratchit toils, Scrooge is visited by his nephew and invited to Christmas dinner the next day. Scrooge declares that those who celebrate Christmas should be boiled in their own pudding and dismisses him. 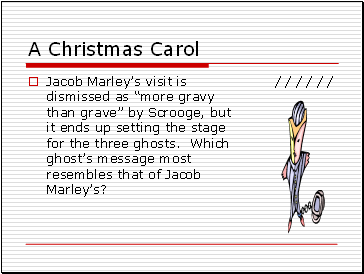 Jacob Marley’s visit is dismissed as “more gravy than grave” by Scrooge, but it ends up setting the stage for the three ghosts. 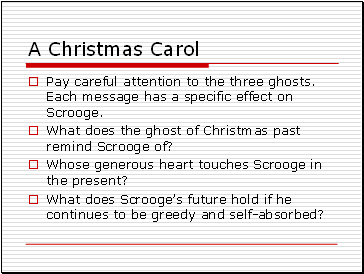 Which ghost’s message most resembles that of Jacob Marley’s? Pay careful attention to the three ghosts. Each message has a specific effect on Scrooge. What does the ghost of Christmas past remind Scrooge of? Whose generous heart touches Scrooge in the present? 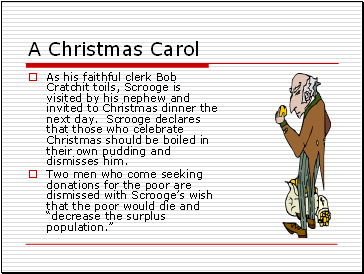 What does Scrooge’s future hold if he continues to be greedy and self-absorbed? 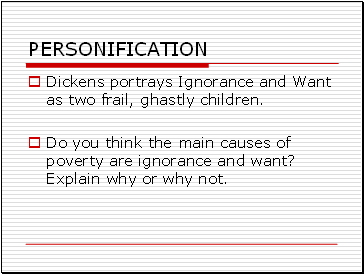 Dickens portrays Ignorance and Want as two frail, ghastly children.